Hatters’ duo James Shea and Andrew Shinnie felt striker Danny Hylton was harshly dealt with by referee Darren Drysdale during Saturday’s 0-0 draw at Plymouth Argyle yesterday. The forward was shown yellow on the half hour, to the delight of the home faithful, for what appeared a mere coming together with home defender Yan Songo’o. A frustrated Hylton was then spoken to by Drysdale once more after picking the ball up when not being awarded a free kick five minutes later, with the official clearly giving him a final warning. 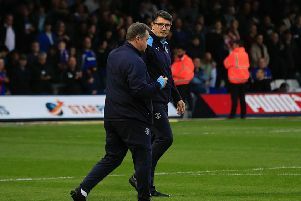 It left Town boss Mick Harford with little option but to bring his attacker off, with Kazenga LuaLua on in his place, to ensure his side didn’t go down to 10 men before half time. Speaking afterwards, Shea said: “It was a shame Hylts had to come off, but I didn’t think it was a booking the first one. “He was probably just getting it because he’s Danny Hylton. “He’s got this reputation about him which is unfair, but he’s had to take one for the team as we couldn’t be going down to 10 men. “Hylts understands that the team comes first and that’s the main thing. “It’s a shame as he’s a big player for us Hylts and we want him on the pitch as much as we can. Meanwhile, Shinnie also felt for his team-mate, adding: “Hylts made one challenge and then he got his card out straight away, no warning or anything. “I thought Mick made the right decision to be fair as one more foul and Hylts probably would have got sent off. “It was one challenge, one booking straight away, where their player has made a few fouls and got away with it.